Just went out to get some plantains for lunch. I have been hungry for platains since last night, so am having fried plantains for lunch while I am watching "Alexa Chung" on MTV--love her oxford--she has a fabulous style. 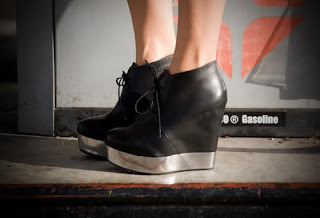 Love the look, darling, especially your mesh booties! i looove your sequin vest, f21??? yeees, alexa chung is zeeee best- my role model straight up! i love everything on your last post, specially the hat, wow! This is a great look. Very nice. Love that sequin vest! So fab! I definitely agree that Alexa Chung has a great style! Those Acne shoes are amazing aren't they? Plus, Rumi at Fashion Toast wears them very well. Wooooow the stylish cocktail short denim shorts / "Fetish peep toe effect" truly sounds as such a "BOMBnextDoor-esque Delight" !!!! You look amazing. I love everything about this effortlessly chic outfit. And I agree... those Acne wedges are pretty intense. I could really use a pair in my life. p.s how yummy are fried ripe plantains? !